I LOVE LLORET LA CASTANYADA..In Catalonia all saints day and the evening before are known as the Castanyada meaning the day of the chestnut. Historically La Castanyada was to honour saints and dead ancestors, when whole villages kept vigil all night with the church bells ringing throughout the night. The villagers would eat 'Castanyes' roast chestnuts, 'moniatos' roast sweet potatoes and 'panallets' small almond balls covered in pine nuts these high energy foods along with copious amounts of Mucsat in porrons were served to stop people from passing out with exhaustion from the lack of sleep and the effort of ringing the heavy church bells. All saints day is also the day that the Spanish visit cemeteries taking flowers and sprinkling holy water on loved ones graves, the chrysanthemum is the traditional flower of remembrance. There is also a special All saints cake 'ossos de sant' which is white and bone shaped. I LOVE LLORET MARKET..Tuesday is Lloret de mar market day 100s of stalls set up close to the Hotel Olympic every week. Theres a wide variety of goods on offer including shoes, handbags, all sorts of T shirts and clothes, toys and souvenirs, at the far end of the market there are fruit/veg stalls selling a magnificent array of goods. Lloret market is a fun way to pass a couple of hours and maybe pick up a bargain!. 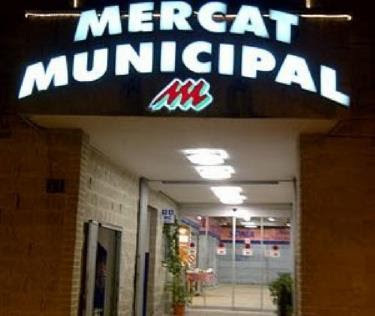 I LOVE LLORET MARKET MUNICIPAL..The market municipal is a weekday indoor market selling the freshest local produce available, fruit, vegetables, meat, fish and flowers plus household goods and wines..if you are on holiday pop in and have a look, its an experience. Check out the Mercat municipal YouTube video below. 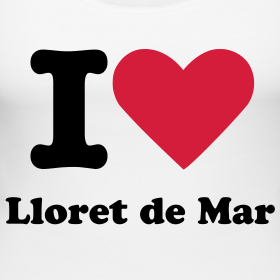 I LOVE LLORET OLD LLORET DE MAR..